From the founders of Greenhouse Juice Co., this collection of 100 easy recipes–50 to eat with a fork, spoon, or your fingers, and 50 to serve in a glass–makes eating and drinking more plants effortless. From breakfasts both quick and leisurely to satisfying lunches and weekday-friendly dinners, the food recipes in this collection prove how simple it can be to create delicious and even decadent plant-based meals to delight omnivores and vegetarians alike. Canada’s leading cold-pressed juice start-up company reveals their “secret sauce” by sharing their private recipes for juices, smoothies, nut milks, tonics, and cleanses. 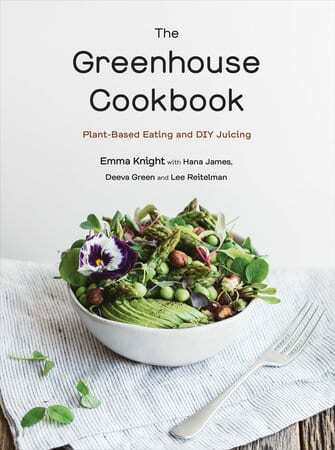 Delving into the nutritional properties of their favourite plants, and offering easy instructions for homemade plant-based drinks, The Greenhouse Cookbook is a great gateway into the sometimes-alienating world of brightly coloured liquids. Knight and co. are “flavor focused,” so you won’t feel like you’re missing out on anything, whether you’re indulging in chocolate hazelnut spread on ancient-grain bread, Moroccan sweet-potato hash or vanilla-bean cheesecake with whipped coconut cream. And that’s just the food! Nearly half the book is actually drinks—smoothies, nut milks, tonics, and juices—all of them amazingly delicious and fun to make...Besides being a beautifully photographed cookbook to flip through, this colorful collection of plant-based dishes proves how fruits and veggies can be utilized for every meal––from peach-crisp breakfast smoothies and spicy mushroom lunch tacos, to casual dinner candidates like a spiralized zucchini mac ‘n’ cheese finished with sweet potato brownies. Emma Knight is a co-owner of Greenhouse and is responsible for the brand's voice. Prior to the launch of Greenhouse, Emma was living in Paris, where she studied and worked in media. She now lives in Toronto with her partner, filmmaker, and Greenhouse co-founder Anthony Green. Deeva Green is a chef, teacher, and traveler. She has contributed to product development at Greenhouse Juice Co. and is a co-founder of Caravan Foods, a farm-based food venture. She lives in New York City. Lee Reitelman is a chef, teacher, and traveller. She has contributed to product development at Greenhouse Juice Co. and is the co-founder of Caravan Foods, a farm-based food venture. She lives in New York City. Hana James is a co-founder of Greenhouse and its Director of Community. She lives in Toronto. While drinking raw vegetable juice is no doubt a good thing in and of itself, the real magic appears to be in the domino effect a juice habit can have on other behaviour patterns, knocking them in a more constructive direction. From our very first days in business we have had the privilege of watching Greenhouse serve as a catalyst for healthy change in people's lives.